I saw a picture of this grilled potato chips long back on FB and thought, woww this is really neat! So this morning I got up with such craving for a good juicy Chicken chop with Black Pepper Sauce that I thought I just have to make it no matter what! 1. Peel and clean the potatoes. 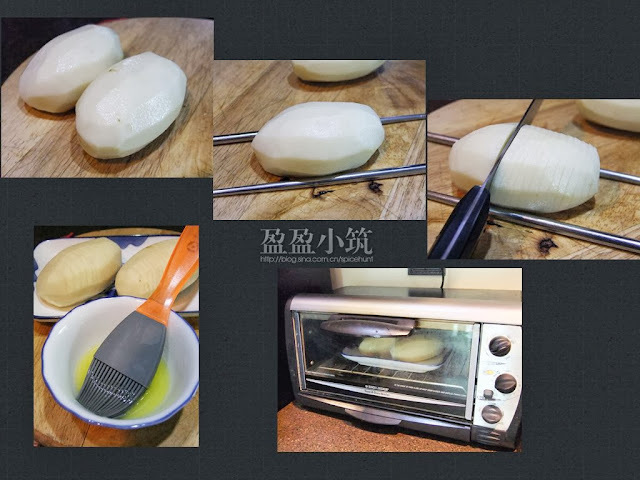 Use a pair of chopstick or thick bamboo skewer, place one at each side of the potato to hold the potato together, the stick will prevent knife from cutting the potato all the way through. Now proceed to slice the potato to the thickness of your liking. 2. Preheat oven to 400F (205C). Mix together melted butter and olive oil and brush the mixture on the potato, do it twice if you wish. 3. Bake the potatoes for 45 minutes, turn the oven to broil and broil it for another 5 minutes or until the top part turn golden in color. 4. Season with some black pepper and salt before serving.